Where do Moses and the 10 Commandments appear? Where do Moses and the 10 Commandments appear in the Supreme Court building? Research by Jim Allision. Writing by Tom Peters. This document will look at the three topics: (1) unquestioned representations of Moses and/or the 10 Commandments, (2) a questionable representation of the 10 Commandments, and (3) important architecture in which Moses and the 10 Commandments are omitted. Moses and/or the 10 Commandments appear three times in the architectural embellishment of the Supreme Court building. Two of these representations depict Moses as simply one of several important lawgivers; these representations tend to disprove the idea that the 10 Commandments have some special relationship to American law. The third instance has the Commandments as one of two artistic adornments on a set of doors. Law as an element of civilization was normally and naturally derived or inherited in this country from former civilizations. The "Eastern Pediment" of the Supreme Court Building suggests therefore the treatment of such fundamental laws and precepts as are derived from the East. Moses, Confucius and Solon are chosen as representing three great civilizations and form the central group of this Pediment (Descriptions of the Friezes in the Courtroom of the Supreme Court of the United States and of the East and West Pediments of the Building Exterior, p. 9). Nothing in MacNeil's description, in other words, suggests any special connection between American law and the 10 Commandments. Moses is simply one of three important lawgivers from the East. The South Courtroom Frieze. The Courtroom friezes were designed by sculptor Adolph Weinman. These friezes are located well above the courtroom bench, on all four walls. The South and North wall friezes form a group that depicts a procession of 18 important lawgivers: Menes, Hammurabi, Moses, Solomon, Lycurgus, Solon, Draco, Confucius, Augustus, Justinian, Mohammed, Charlemagne, King John, St. Louis, Hugo Grotius, William Blackstone, John Marshall, and Napoleon. Moses is holding blank tablets. The Moses figure is no larger or more important than any other lawgiver. Again, there is nothing here to suggest and special connection between the 10 Commandments and American law. Weinman's training emphasized a correlation between the sculptural subject and the function of the building and, because of this, Gilbert relied on him to choose the subjects and figures that best reflected the function of the Supreme Court building. Faithful to classical sources, Weinman designed for the Courtroom friezes a procession of "great lawgivers of history," from many civilizations, to portray the development of secular law (p. 2, emphasis ours). The Oak Courtroom Doors. The oak doors separating the courtroom from the central hallway of the Supreme Court building contain a representation of tablets bearing the Roman numerals one through ten; the Commandments themselves are not written out. The tablets depiction is located on the inside bottom of the doors. 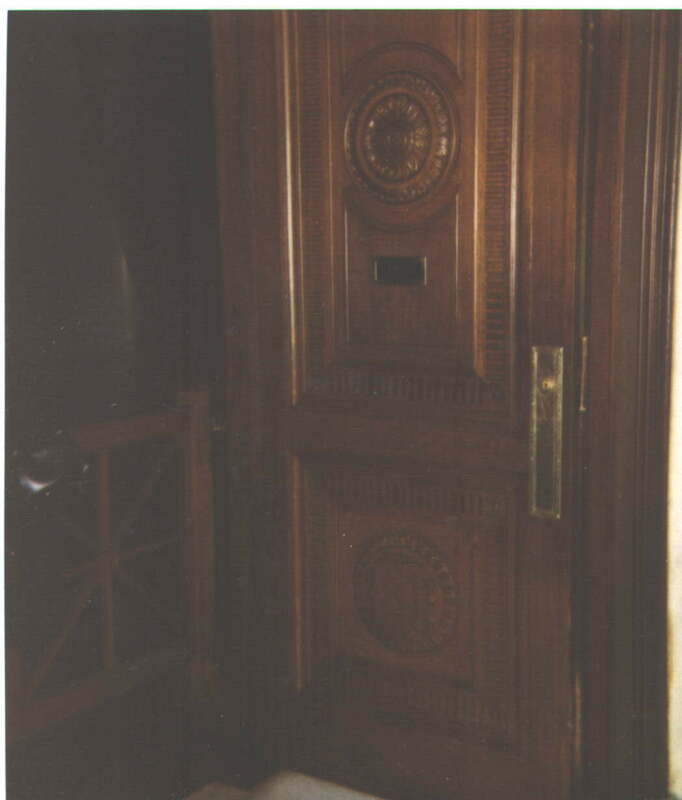 A second artistic embellishment (a circle with engraved woodwork) is located at eye-level on the inside of the doors. Click here for a close-up of the tablet depiction. Click here for a picture of the entire door (the tablet depiction is the bottom circle). 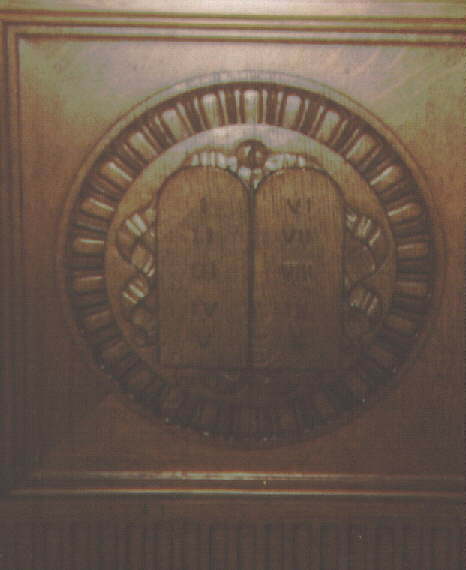 It's interesting to note that the engraved circle embellishment is placed at eye level, while the 10 Commandment depiction is placed toward the bottom of the door in an out-of-the-way position. The Commandments are, of course, a perfectly logical artistic embellishment for a court of law but, given its placement, it doesn't appear that the artist has any special regard for the Commandments. Additionally, we note that the oak doors seem to be of little consequence as artistic creations. A search of the University of Louisville library turned up a number of books that discuss the architecture of the Supreme Court, and while all of them discuss the two pieces mentioned above, none of them mention the doors. It does not appear, in other words, that the doors are regarded very highly by scholars of art. The East Courtroom frieze depicts two male figures representing "The Majesty of Law" and "The Power of Government." Between the figures is a single tablet bearing the Roman numerals one through ten. While some accommodationists interpret this tablet as the 10 Commandments, every source I've consulted says that the tablet represents "early written laws." I see no ground for thinking that these books are wrong, especially since (1) these scholars have studied the original explanations of the art provided by the artists themselves, and (2) the 10 Commandments are usually depicted as being written on two tablets. We're trying to find a copy of Weinman's original commentary on this sculpture. When we do, we'll post it here. Where are depictions of Moses and the 10 Commandments omitted? The short answer: almost everywhere where they ought to appear if the intent of the art was to indicate a connection between the 10 Commandments and American law. There is nothing in the artistic embellishment of the Supreme Court building that would indicate that the artists had any special regard for the 10 Commandments. Consider, for example, the North (front) entrance to the building. If there was any desire on the part of the artists to indicate a fundamental role for the 10 Commandments, this would be the place to do it, but the front of the building contains no references to Moses or to any other Biblical theme. Rather, one encounters two massive Roman-type sculptures representing "The Authority of Law" and "The Contemplation of Justice," a frieze depicting "Equal Justice Under Law," and a set of massive bronze doors that depict scenes from Greek, Roman, and Anglo-Saxon law. None of these are connected in any way to Biblical themes. Similarly, there are all sorts of artistic embellishments scattered throughout the main floor of the building, but none of them are obviously religious. Put simply, there is little in the Supreme Court Building that suggests any desire on the part of the artists to enshrine the 10 Commandments as the foundation of our law. Finally, we note that not once are the actual words of the 10 Commandments reproduced in the Supreme Court building. One finds tablets, and sometimes these tablets have Roman numerals on them, but we never find the Commandments written out. If the intention of this art is to convey that the 10 Commandments are so important to our law, wouldn't it make sense for them to be reproduced in full at least once? Return to "The 10 Commandments and the Supreme Court Building"